The spring season is here, and we hope you're enjoying the change in weather! One of the great things about card games is that every season is a great time to play them. Exodus is a fast game, which means you can sit down and enjoy a game with someone, even if you only have a couple minute break. We've had an aggressive convention schedule and will continue with at least 2 con appearances/events per month through September in USA and Canada. Come by our booth this weekend (April 18th, 19th) at Big Wow Comic Fest in San Jose at the convention center! Or catch us next weekend at YumeCon 2015 (during April 25th) at the SME Center at Foothill College in Los Altos Hills, California. If you haven't seen us at a con yet, watch out for a homepage banner with a link to upcoming cons we'll be at shortly. Our Limited Edition "Airship" campaign is still going on, so come see us in-person to receive a special card! Plus, we love meeting everyone (and helping you teach your friends how to play). Playing against confident challengers in-person is always a highlight! 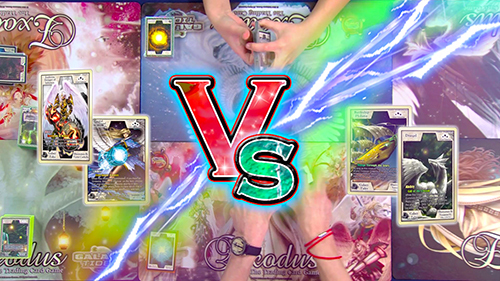 We've released several new gameplay videos recently, the latest one being Twin Cannon Angels VS Battleship/Drangel! We're taking a little more time to finish developing the Exodus Organized Play website. We want to make sure everything is absolutely perfect before the launch. Regular tournaments and booster drafts will be available soon for you to rank your way to the top! 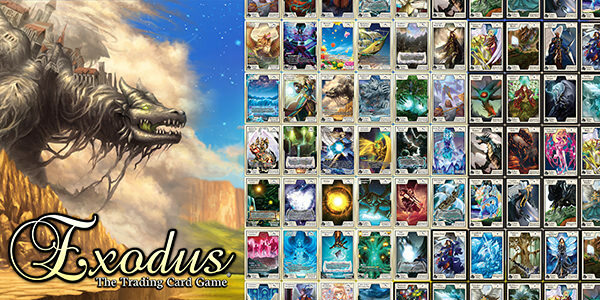 You can be sure that the Exodus TCG OP site is going to be unlike anything you've seen before. There will be interactive elements to the site, and you'll be able to do far more than just look-up your ranking! Announcing the Featured Card of the Month! In this column we feature a new Exodus card every month. Crystal Bell gets this month's card spotlight, and for good reason, too. It's one of the harder cards to pull from the Galaxy Tides booster pack and is the card that everyone is talking about. Well, everyone who is playing Shardfolk! It's effect reads, "Each player draws 1 card from their Main Deck for each Shardfolk in play." What amazing draw power! The possibilities are literally endless with the potential for how many cards you could draw. 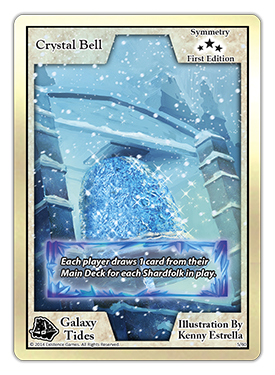 As long as you focus your efforts on summoning tons of ice creatures, you could be drawing 4, 5, 9 or more cards per turn! Your opponent also gets to draw that many cards, so playing it strategically is key. With lots more support coming for Shardfolk next set, there will be even more options for our frozen friends. This card has helped make Shardfolk decks known as the Draw Decks, and provides more than enough in those terms. This means you can expect Shardfolk to have a new Ability skill set in the expansion. That's all for this issue! We hope you're enjoying Exodus and hope everyone will take a little time today to play it with someone you know. Have fun and we'll see you soon!